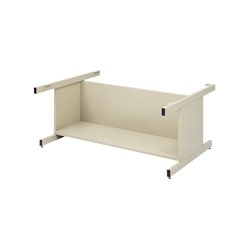 Please note that the 5 drawer steel flat file and closed base featured in the video above are sold separately. Raises files 20" off the floor. Sturdy all-steel base supports up to two Steel Flat Files. Base has enclosed back and sides with an open front for extra storage. Durable powder coat finish, with easy assembly.